If you’ve been injured on the job and are missing time from work, you probably have many questions. You are likely wondering how you will be able to pay for your medical bills while you can’t work, what steps you can take to ensure your workers’ comp claim is paid, or if you can file an appeal after receiving a denial. You aren’t alone. Each year, thousands of injured workers come to our site to learn more about their legal rights after being hurt on the job. You have come to the right place. Our experienced attorneys are here to answer all of your questions about workers’ compensation and Social Security Disability in New York. We encourage you to read through our informative FAQ section below and contact us with any additional questions you may have. Markhoff & Mittman, P.C. has been helping injured workers in New York to recover workers’ compensation since 1933. As a result, we have heard many of the questions about workers’ compensation. Below is a list of some of the most common questions that we hear from our clients, along with quick answers to those questions. While these answers are intended to help you better understand workers’ compensation in New York, we encourage you to call us to speak with an experienced attorney about your specific circumstances. What Is Insurance And Why Should I Care About It? What Is Workers’ Compensation & How Does It Work? Does My Employer Have Coverage If I Get Injured On The Job? I’ve Been Injured On The Job. What Should I Do Now? What Types of Work-Related Injuries Are Eligible For Workers Comp? Can I Collect Workers’ Comp & Social Security Disability Benefits At The Same Time? After I Receive A Section 32 Lump Sum Settlement Can Workers’ Comp Take It Back? How Do I Know What My Retirement Age Is For Social Security Purposes? If I Am Collecting Unemployment Can I Receive Workers Compensation Benefits Too? Who Chooses The Doctor I See If I Am Injured At Work? Does The New York City Employees Retirement System (NYCERS) Demand Money Back If I Get Workers Comp Payments? What Do I Do If My Employer Doesn’t Have Workers’ Compensation Insurance? Can The State Garnish My Workers’ Compensation Check For Child Support? If I Didn’t Wear A Hard Hat On The Job Can That Affect My Workers’ Compensation Claim? Do Workers’ Compensation Laws Apply If An Employee Is Working On Their Own Home With Their Own Equipment? Are Workers’ Compensation Hearings In New York Open To The Public? Is Physical Therapy Covered By Workers’ Compensation? What Is The Workers’ Compensation Board Medical Director’s Office? What Happens If I Was In An Accident But Failed To File a Workers’ Compensation Claim? Do The New York Workers’ Compensation Board Medical Treatment Guidelines Apply To All Payer Types? Do The Medical Treatment Guidelines Have To Be Adhered To If The Injured Worker Needs Emergency Treatment? Can I Sue For An Accident At Work On A Construction Site? What Types Of Construction Accidents Qualify For A Special Lawsuit For Pain And Suffering In New York? Is An Injury Or Damage To The Lungs Covered By Workers’ Compensation? Is Treatment By A Chiropractor Covered By Workers’ Compensation? What Guidelines Do Doctors Use To Determine The Extent Of My Disability? If And When I Can Resume Normal Activity, Will I Still Be Eligible To Receive These Payments While Seeking A Settlement? What Types Of Benefits Does Workers’ Compensation Pay? “What If A Worker Fails To File A Claim For Workers’ Compensation? If I Am Applying For Unemployment Does Receiving Workers’ Compensation Benefits Affect This? What If My Work Injury Wasn’t Caused By My Employer But Was Caused By Another Party? Will This Impact Any Workers’ Comp Benefits I Receive? 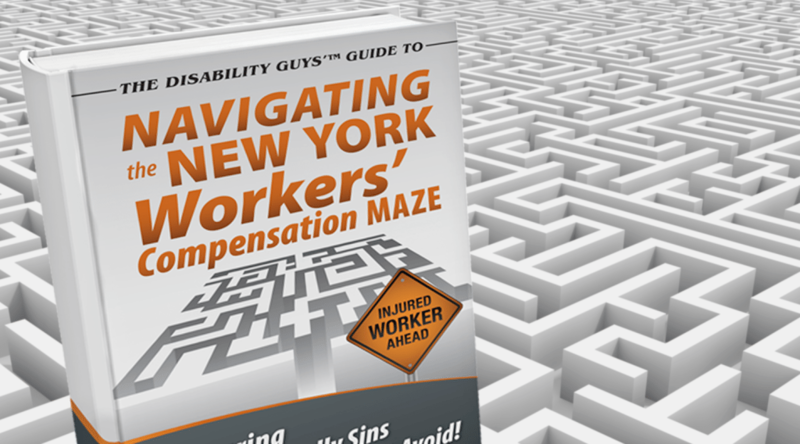 Where Does The Money Come From To Pay Workers’ Compensation In New York? I’m Filing Out My Workers’ Comp Paperwork And I’m Afraid Of Making Mistakes. What Do I Do? What Should I Do If I’ve Been Hurt On A Construction Site? How Do You Explain Being Fired Due To A Workers’ Compensation Issue? If I Can’t Sue My Employer Due To The Workers’ Compensation Law Who Can I Sue For My Injuries On A Construction Site? What If I Need Medical Care In The Future After My Claim Has Been Resolved? How Long Do I Have To Work For An Employer Before I Am Covered By Workers’ Compensation? What Types Of Job Are Covered By Workers’ Compensation? Must I Sign Medial Releases Sent By The Insurance Companies? When Will My Weekly Workers’ Compensation Benefits Begin? What is the New York Workers Compensation Weekly Wage Benefit? Can I Choose Which Doctor To Go To? Should I Send You Any Correspondence I Receive From Workers’ Comp Or The New York State Insurance Fund? When Must A Physician Request Advance Authorization For Medical Care? Is Medical Care Provided In The Case Of An Accidental Injury Even When No Claim Is Made For Weekly Cash Benefits? What Should I Do If I Am Not Happy With The Decision Made By Workers’ Compensation Law Judge? Should I Talk To The Insurance Company Nurse Case Managers, Claims Examiners, Or Investigators? Can A Nurse Case Manager From The Insurance Company Come With Me To See My Own Doctor? Why Did The Insurance Company Reduce My Check If I’ve Been Injured On The Job? If I Pay For Transportation To And From My Doctor Can I Be Reimbursed By The Insurance Company? Are All Types Of Injuries And Diseases Covered Under The Workers’ Compensation Law? Do I Have To Go To The Insurance Company’s Doctor (The Independent Medical Exam)? Is Workers’ Compensation A Lawsuit Against My Employer? If I Settle A Lawsuit Stemming From My Work Accident Does That Affect My Workers’ Comp? If My Doctors Say I Have A Partial Disability Must I Look For Work Within My Restrictions? Should I Contact My Case Manager Directly To Follow Up On Scans? My Doctor Told Me That I Am Doing Better And Do Not Need To See Them As Often – However I Am Still Not Working. Is This Ok? The Judge Agreed To Retro Back A Couple Of Months Ago, Although After Several Surgeries This Disability Has Kept Me From Obtaining Employment. Will This Be Addressed In Due Course As Time Lost? Can I Video Tape My Independent Medical Exam (IME)? Why Can’t I Get The Medical Treatment Recommended By My Doctor? If I Am Diagnosed With A Permanent Partial Disability Can I Get Lifetime Benefits?? If I Was Working Off The Books Am I Still Entitled To Workers’ Compensation? If I Didn’t Follow The Safety Rules Can I Still Get Workers’ Compensation? Workers’ compensation states that employees have the right to receive benefits when they are acutely injured, develop an injury or contract illnesses at the workplace. The purpose of the law is to protect employees who are injured on the job and help them return to gainful employment as soon as possible after an injury or illness. In return for this protection, workers give up their right to sue their employer for negligence. The idea is to limit litigation fees and protect workers in the unfortunate event that they suffer an injury. This would be a fair deal if workers always received the benefits that they are guaranteed under the law. To learn more about workers’ compensation and how it works, click here. Myth 1: If you speak to the insurance company or write a letter explaining your case and are reasonable, you will get a reasonable response that “pays” you what you deserve. Myth 2: When you are involved in a work-related accident and the insurance company calls you to ask for a statement, you have to give them a statement or you cannot receive benefits. Myth 3: All lawyers who advertise that they handle workers’ compensation cases have the same ability, tools and experience to handle your case. Myth 4: Your employer’s insurance company will quickly approve and pay for the medical treatment since you were injured while working. Myth 5: The Workers’ Compensation Board will step in and protect your rights and make sure you get the benefits you are entitled to. Myth 6: The paperwork you need to file is simple and doesn’t need an attorney. Myth 7: Most compensation claims are made up, fraudulent and people would rather be on compensation and “milk” the system instead of working. Myth 8: Filing a claim is suing your employer. Myth 9: Your employer will make sure you get the benefits you deserve quickly and keep your job open for your return. Myth 10: Your employer will file a claim on your behalf and you will not have to do anything; by notifying your employer that is all you have to do. Under New York State law, all employees who are injured in the course of work are entitled to receive workers compensation, regardless of what caused their injury. However, it is often difficult to obtain workers’ comp benefits because the claims process is complicated and insurance companies will try to deny your claim in an effort to avoid paying up. In order to obtain workers’ compensation benefits, an injured worker must prove that he or she has an injury, illness or disability that occurred during the course of his or her employment. Additionally, the complicated application process and the interest of the insurance companies to deny your claim can make it very difficult. If you were injured on the job and are wondering if you are eligible for workers’ compensation benefits you can contact The Disability Guys for a free consultation. In general, every employer in New York is required to purchase Workers Compensation Insurance. This insurance protects you if you are injured while working. It pays for medical care for the injury and lost time benefits. This insurance is mandatory and your employer cannot charge you for the insurance coverage. However, there are situations where an employer does NOT have to have that insurance, but those are limited circumstances. They include NYPD, NYFD and Sanitation, if your employer is the US Government – a separate law – a longshoreman or if you are an independent contractor. Think about it. You wouldn’t want to be hit by a car that didn’t have insurance – you certainly do not want to work for an employer who does not have workers compensation insurance. Knowing what to do after a workplace injury can help improve your chances of obtaining any workers’ compensation benefits that you may be entitled to. While there are many other steps that you will need to take after reporting your injury and seeking medical attention, these three steps are very important and time sensitive. If you were injured at work and are wondering what to do click here. Under New York law, employers are required to provide workers’ compensation for all employees through an insurance plan or via self-insurance. Additionally, New York workers’ compensation states that injured workers’ are entitled to receive benefits for any type of injury, regardless of what caused the injury. Did you suffer an injury not included above? Don’t worry. We represent all injured workers in New York regardless of the type of injury sustained. To learn more about specific work-related injuries click here. What Is The Process For Filing A Workers Compensation Claim? The process for filing a workers’ compensation claim is complicated and obtaining benefits is often much more difficult than people expect. Unfortunately, many injured workers are denied the compensation that they need because they do not seek legal help. Many workers are not able to obtain compensation for their injuries because they do not understand the workers’ compensation process or miss important deadlines when applying. As you can see there are several important steps involved in filing a workers’ compensation claim. Understanding these steps and filing information on time is critical to winning your claim. Unfortunately, workers compensation claims are often denied on the first application. However, just because your claim is initially denied does not mean that you should give up. If you believe that your claim for workers’ comp benefits was wrongfully denied you can file an appeal with the New York Workers’ Compensation Board. To learn more about denied claims and how to appeal, click here. When applying for benefits your claim may go to hearing before the New York Workers’ Compensation Board. Hearings are often required to settle disputes that arise during the claims process such as a claimant’s eligibility for benefits or calculation of average weekly wages. Additionally, a hearing may be required if you decide to appeal a denied claim. Read our informative page “How Does A Workers’ Comp Hearing Work?” to learn more about hearings and how you can be best prepared for them. When you file for a workers compensation claim, you are entitled to receive two-thirds of your Average Weekly Wage and the Maximum Benefit. Why are you limited in the amount of workers’ compensation benefits you receive? The idea is that two-thirds of your average wage would be the equivalent of your take-home pay since workers’ compensation is not a taxable benefit. Said in another way, if you were earning $600.00 a week you may take home $400.00 a week. However, there are limits on the total amount of compensation that you can receive in New York. For more information on the amount of Workers’ Compensation benefits, you may be able to receive in New York, click here. A scheduled loss of use award is an award that determines the amount of money you will receive based on the loss of use (such as a restricted range of motion) you have to a specific injured body part (usually limbs/digits). This percentage is determined by medical evidence such as treating doctors’ report and the Independent Medical Examiners report, if any. The “schedule” is a determination made by the legislature as to what a specific body part is worth. Currently, for example, a 100% Schedule to your arm is worth 312 weeks of compensation. If your doctor says you have a 10% schedule of your arm then it is worth only 31.2 weeks! Your weekly earnings determine the “rate” of your benefit which is then mulitplied by the percentage of loss schedule to give you a monetary figure. What is good about such awards are that you could potentially receive money for a permanent injury even if you had a short amount of time out of work! You generally have 2 years from the date of accident or knowledge of the injury to file your claim with the Workers Compensation Board. Simply notifying your employer is not sufficient. You should contact an attorney to discuss the exceptions to this rule if you have missed a deadline. Under New York Law an employer may not fire or otherwise discriminate against an employee for filing a Workers Compensation claim. However, an employer may replace an employee who cannot return to the job if the position needs to be filled for business reasons. If you were fired or your employer retaliated against you after reporting an injury or filing for workers’ compensation then you may have legal options. Read more about what to do in this situation here. Are Workers’ Compensation Benefits Taxable In New York? Whether Workers’ Compensation Benefits are taxable in New York depends on certain facts, and each case is different. In general, Workers’ Compensation Benefits are not taxable at the Federal, State, and Local level. However, there are instances in which Workers’ Compensation Benefits could be taxed based on certain circumstances, such as receiving benefits for workers’ compensation and Social Security disability. To learn more about situations in which Workers’ Comp benefits may be taxable, click here. It is possible to receive both Workers’ Compensation and Social Security Disability benefits at the same time. However, you must qualify for both. Additionally, there are limits as to how much compensation an injured worker is able to receive based on his or her average current earnings. To read more about eligibility for Social Security disability benefits and maximum compensation limits click here. While you are not required to have an attorney by law, an experienced workers’ compensation lawyer can provide help in several ways. For starters, a workers’ comp lawyer can help you navigate the complicated process of filing a claim and make sure you submit required information on time. Additionally, a workers’ comp lawyer can help you appeal a denied claim. By hiring a workers’ compensation lawyer you can maximize your chances of recovering the financial support that you need. Our New York workers’ compensation lawyers offer free consultations to help injured workers determine whether or not they need an attorney. If you have been injured at work and want to know more about how a workers’ compensation lawyer can help you obtain just compensation, click here. A fair and reasonable fee will be determined by a Workers Compensation Law Judge and deducted from your benefits. You will never have to pay an attorney directly. Section 32 settlements are full and final, just like a general release in a regular lawsuit. However, you must go through various steps. The final steps are (1) Approval from the Workers’ Comp Judge, THEN (2) a ten day waiting period where any side can withdraw and then (3) the issuance of the final decision. Once that happens you are supposed to be paid and the case is over. Social Security has set different retirement ages based on your year of birth. This is extremely important when applying for regular retirement benefits, disability benefits or early retirement benefits. If you were born after 1960, the full retirement age will increase to 67 depending on the year you were born. If you take an early retirement (62) you will receive, permanently, a reduced benefit. However, if you become disabled during the time between early retirement and regular retirement, you may be eligible for disability benefits and a non-reduced full retirement! Also, if you are able to continue to work after full retirement age you may be entitled to higher benefits due to special credits and additional earnings. You may continue to receive unemployment benefits, if you receive workers’ comp benefits, as long as you are physically and mentally capable of working, and are prepared to start employment immediately. However, your weekly unemployment benefit rate may be reduced. The total weekly amount of your workers’ compensation and unemployment insurance benefits cannot exceed your average weekly wage in the base periods. It is your responsibility to notify the Telephone Claims Center (NYS Dept of Labor) regarding any workers’ comp benefits you receive during the same weeks you are collecting unemployment insurance. Failure to do so may result in your having to repay benefits you received. You should also contact the telephone claims center if your workers’ comp benefits were reduced or ended. Click here for a detailed answer. In the vast majority of cases, you the injured worker, have complete choice as to the doctor you see. In fact, unless you sign a waiver giving up this right, in most cases the employer is not even supposed to recommend a doctor to you. The New York City Employees Retirement System (NYCERS) can and will demand money back. ¾’s is the most you can collect. You must pay back whatever you get in Comp money to NYCERS, or stop getting Comp payments. NYCERS WILL come after you. SSD is separate and not a set off for Tier 4, which most people are now. If you are injured at work and your employer is not carrying workers’ compensation insurance, you should still seek medical attention because you are permitted under New York workers’ comp law to file a personal injury lawsuit against your employer. Your employer may also be fined for failure to carry the insurance. For more detail click here. It may be possible for the state to garnish your workers’ compensation check if you owe money for child support. Workers’ compensation is seen as a replacement for the wages that you would have earned prior to being injured and so can be used for child support. Read on to discover how the state calculates how much will be taken from your workers’ compensation check. Negligence refers to the duty of care that others owe to the people that they interact with on a day to day basis . If someone breaches this duty of care, then they have been negligent. For those that have been injured on the job, the negligence of another employee, employer, or even a company could be what caused them pain. If another person’s negligence caused you serious harm, it may be possible to pursue legal action in order to recover any losses that have suffered as a result. Learn more about how negligence applies to workers’ compensation here. Learn about how failing to wear a hard hat on the job can affect your workers’ compensation claim on this page. If you were receiving workers’ compensation benefits and are wondering why they recently stopped, read on to discover what your options are. An employee had a home office in her basement, went upstairs to get a drink while talking on the phone with her supervisor and was injured as she fell on the way back down to her office. The court ruled in the workers favor stating that the employee injured herself in the course and scope of her employment because she was engaged in furthering the employer’s business at the time that she was injured. Yes, they are public hearings. You can sit in on the hearing. However, individual judges may ask you to identify who you are and why you are there. If you are attending a hearing with a friend or family member you can advise the judge of that. If you may potentially be a witness in a case, then the Judge will likely ask you to sit outside the hearing room until you are called to testify. Yes, physical therapy is covered by workers compensation. If you neglect to file a workers’ compensation claim, you put yourself at risk of losing your rights to benefits and medical care. If you or a loved one is in this situation, contact a workers’ comp attorney for advice and assistance. The medical treatment guidelines apply to all private and municipal self-insured employers, group self-insured trusts, all Special Funds, the State Insurance Fund, and private insurance carriers. NO. The treatment guidelines do NOT have to be adhered to if emergent medical care is necessary. Medical Treatment Guidelines are evidence based standards of care and best practices for the medical treatment of work related injuries. The use of these guidelines is mandatory for treatment rendered to the mid and low back, knee, shoulder and the neck for dates of service on or before December 1, 2010, regardless of the date of the injury. Some insurance contracts do have cooperation clauses. However, you may NOT be obligated to give a recorded statement. If you do, be sure to ask for a written copy of the transcript – this recorded information can be used against you. While the NY Workers’ Comp law does NOT allow you to sue your employer, you may be able to sue building or property owners or general contractors or others responsible for your injuries. Contact our office to learn more. There are numerous construction accidents that qualify – some of them are listed below. Contact our team for additional information regarding your accident. Yes. An individual who has suffered injury to the lungs due to exposure to harmful substances in the workplace including asbestos, fumes, smoke or chemicals may be entitled to workers’ compensation. Lung cancer, asbestosis and mesothelioma – a rare form of cancer – are examples of illnesses caused at work. Yes, chiropractic care is covered by workers’ compensation in New York. Yes, New York State (NYS) is an “employment-at-will” state. Without a contract restricting termination (such as a collective bargaining agreement), an employer has the right to discharge an employee at any time for any reason. However, there are a few exceptions to this rule – most significantly are laws enforced by the NYS Division of Human Rights which prohibit discrimination based upon race, creed, national origin, age, handicap, gender, sexual orientation or marital status. It is important to note this law also protects the employee’s right to resign. Just as an employer may file an employee for “no reason” – or a reason that might seem arbitrary or unfair – an employee is equally free to quit at any time without being required to defend or explain the reasoning. The doctors are supposed to use medical guidelines – the guidelines state that the decision can be made a year after the last surgery and if the doctor believes you have leveled out and no additional care will improve your condition. Injuries to the extremities (knees, arms, hands, feet) will usually settle based on overall permanent injury to the body part, less the prior money paid out on the case for lost time. If you return to work but earn less money as a result of your injury then we will try to get you ongoing benefits. But, that depends on a lot of facts – we will let you know if those facts arise. If you are working when you are injured, then you may be able to make a workers’ compensation claim against your employers policy; whether you have had an accident such as a car crash, slip down the stairs, fall off a scaffold, a door slammed on your hand, etc), a repetitive injury (carpal tunnel from typing, elbow or neck injuries from sewing, cutting and so forth, etc) or even an occupational disease (lung conditions, cancers and other occupational ailments). What If A Worker Fails To File A Claim For Workers’ Compensation? The worker might lose his/her right to benefits and medical care. If you are receiving workers’ comp benefits, but you are available and physically able to perform work, you may be eligible for unemployment insurance benefits. However, your weekly unemployment benefit rate may be reduced. the total weekly amount of your workers’ compensation and unemployment insurance benefits cannot exceed your average weekly wage in the base period. When filing a claim for benefits, you should be prepared to send to the Department of Labor copies of the Workers’ Comp Form C-8 (Notice that Payment of Compensation for Disability has been Stopped or Modified) and a medical statement signed by your physician, attesting that you are able to work. The Telephone Claims Center will determine if any reduction in your unemployment benefit amount, due to receipt of workers’ compensation, is appropriate. If you disagree with the amount of reduction, you may request a hearing. If you are injured in the course of employment, you are entitled to workers’ compensation, regardless of the cause. You may be able to sue a third party that caused the injury, such as the manufacturer, distributor or seller of faulty equipment that caused the injury. If you receive benefits from a third party, your employer or its insurer may be eligible for workers’ compensation reimbursement or they may be able to join the suit. State laws require one of three payment methods or a combination of these methods. 1. Employers may need to carry workers’ compensation insurance. 2. Employers may self-insure by setting up a fund sufficient to cover outgoing benefits. 3. The state may administer its own fund into which employers are required to pay. The safest thing to do is to contact a worker’s comp attorney. If you do insist on completing the forms on your own be sure to do the following; not following a few of these might lead to an investigation of worker’s comp fraud. 1. Report your claim on a timely basis. 2. Clearly state the details of your injury. If you seem to be fuzzy on details or respond vaguely, there might be questions. 3. Answer your phone; don’t ignore the call and then call back in just a minute. If this happens once or twice it’s okay but if it occurs every time the claimant is called, investigators might think fraud. 4. Be sure to go to all your medical appts. Again, there might be reasons for missed appointments; keep in mind though that employees that are truly injured want to get better and back to work asap and rarely miss appts. It seems there is always someone complaining about the high cost of Workers’ Compensation claims. Whether it’s an outrageous story of fraud or abuse, or just banter about the “burden” claims place on the system, the blame for rising Workers’ Compensation costs always manages to wind up on the shoulders of injured workers. However, there are things that many of us in the Workers’ Compensation field have known all along: a large amount of Workers’ Compensation costs can be traced back to the actions of lazy claims adjusters and overzealous defense attorneys who milk the system when defending claims! For example, claims adjusters will often skirt their responsibilities and pass their work off to defense attorneys who will complete tasks at significantly higher rates. Of course, everyone is secretly happy with this arrangement, as the defense attorneys continue to rack up billable hours and adjusters get to take it easy…again, all while passing the blame for rising “costs” onto the worker. And, without “flat-fee” or previously agreed upon fee arraignments, defense attorneys are notorious for engaging in “churning” when working a claim. Churning is any activity for the sole purpose of increasing the legal bill including unnecessary research, motions and discovery or having another attorney or paralegal in the firm review the case. Ridiculously high costs have come about through the years from such actions. For those concerned about the rising cost of Workers’ Compensation claims, independent audits would bring much of these issues to light. Rather than blame the worker who is simply trying to recover and provide a steady living for their family, let’s focus stopping those on the “inside” who routinely milk the system. First things first, get medical attention immediately. Afterwards, call an attorney who will go over your rights with you. Don’t try. If asked why you left your previous employer, you should give a more generic answer like “your skills not being the right fit for your previous employer’s needs.” Then, rather than sitting quietly waiting for the interviewer to ask what you mean, keep the flow going by explaining what your skills are that you bring to the table and how it will fit THEIR organization. You might also ask a question to the interviewer, in an effort to keep the conversation flowing and change the direction of questioning. While it is correct that you cannot sue your employer, many times you can sue building or property owners, general contractors and others responsible for your construction accident injuries. You will most likely have at least a few hearings before a Judge at the New York State Workers Compensation Board. Your right to medical care in future years can be protected if your case is properly handled. The right of an injured worker to reasonable and necessary medical attention may be the most valuable benefit provided by Workers Compensation law. Great caution should be exercised in entering into any agreement that requires you to give up this valuable right to medical care in future years. Be absolutely certain you are aware of all your rights before you consider signing a release or entering a final settlement. Chiropractic care is covered by Workers’ Compensation in New York. You might want to contact an attorney if you have neck and back injuries. A heart attack or stroke caused by the physical or mental stress of employment is generally covered by Workers’ Compensation. Even if you had a prior heart condition or other risk factors not related to your work, you may be entitled to Workers’ Compensation benefits. Heart attack and stroke claims are some of the most difficult claims to establish, so you should consult an attorney as soon as possible. A worker that has suffered injury to the lungs by exposure to harmful substances associated with the workplace, such as dust, fumes, smoke or chemicals, may be entitled to medical care and cash benefits. Asbestosis, lung cancer and occupational asthma are common lung injuries. An employee who has been exposed to loud noises in the workplace is entitled to Workers Compensation benefits for a partial or total loss of hearing. This includes the cost of a hearing aid when necessary. There are strict filing deadlines on “loss of hearing” claims. You are covered the moment you begin your employment. There is no waiting period for coverage. If you were to die on the job, your spouse and dependent children are entitled to weekly compensation benefits. If you have neither a spouse nor children, then your estate may be eligible for a lump sum payment of $50,000.00, plus the cost of funeral expenses. An aggravation of a pre-existing injury is covered by Workers Compensation. This is true even if the earlier injury was not work related or if A Workers Compensation Claim was NOT filed for the old injury. Almost any type of physical injury or mental illness caused by your work is covered. This includes all types of orthopedic injuries, including fractures, herniated discs and muscle strains. Many times employees fail to realize that Workers’ Compensation also covers other types of work-related injuries, including carpal tunnel syndrome, loss of hearing/vision, lung injuries, heart attacks, strokes, hernias, disfiguring scars, and occupational diseases such as asbestos. You should notify your supervisor immediately, or as soon as possible, after your accident. Generally, it should be no later than 30 days after the accident. The employer must then file an Accident Report with the insurance company and the Workers Compensation Board. Almost every type of employment is covered by the New York State Workers Compensation Law. There are a few exceptions, including New York City police officers, firefighters, sanitation workers and teachers, federal government employees and clergy. If you have any doubts about whether you are covered, you should call an attorney. Must I Sign Medical Releases Sent By The Insurance Companies? No. Tear them up and dispose of them unless an attorney tells you otherwise. CASH BENEFITS ARE PAYABLE FROM THE FIRST DAY YOU ARE OUT OF WORK, IF YOU ARE OUT OF WORK FOR 14 DAYS OR MORE. Unfortunately, insurance carriers frequently delay the first payment while the case is “under investigation”. This is a typical insurance company delaying tactic. Claimants often times hire an attorney to expedite their payments when insurance companies delay payments. The amount of weekly benefits you receive during your period of disability is based on the average weekly wage you were earning at the time of your injury. Initially, you should receive approximately 2/3 of your wages. However, the workers compensation law limits the total amount of benefits you can get. – July 1, 1992 and July 1, 2007 your Maximum Rate is $400.00. – July 1, 2007 to July 1, 2008 $500. – July 1, 2008 to July 1, 2009 $550. – July 1, 2009 to July 1, 2010 $600. However, the insurance company will quickly send you to one of “their doctors” and try to cut your benefits below this level. When this happens, you should contact an attorney to petition the court for your fair level of benefits. Also, it is common for injured workers to get large cash awards for injuries to certain body parts even if they have not lost any time from work. New York Workers Compensation Law allows you to seek treatment with the doctor of your choice. While there have been some changes to the law in the 2007 Workers Compensation Reforms, the basic principle remains the same – you choose with whom you want to treat. Preferred Provider Organization – there is a pilot program where certain employer can elect to use a special medical organization and you, the injured worker must attend that organization for a limited period of time. Generally, we have seen this used in Upstate New York more than in the Metropolitan area. Copies of reports are fine, send them and we will attach them to our electronic file if we do not already have them. When you fax them, they are automatically sent to your file. The insurance carrier contesting a claim must file a notice of controversy with the New York Worker’s Compensation Board within eighteen days after the disability begins or within ten days of learning of the accident, whichever is greater. The carrier must give the reasons why the claim is not being paid. The issue is resolved by a Workers’ Compensation Law Judge at a pre-hearing conference or a hearing. Yes. The claimant should send a receipted bill and letter from the attending physician to the insurance carrier, stating that the purchase was necessary and in accordance with the physician’s direction. As of July 11, 2007, the law specifically authorizes pharmacies to direct bill the insurance carrier and requires the insurance carrier to pay for the prescription or reimburse the employee within 45 days of receipt of the claim for payment or reimbursement. It also allows the insurance carrier to contract with a pharmacy or pharmacies and require claimants to use the pharmacy or pharmacies to obtain their prescriptions. The only exceptions are when a medical emergency occurs and it is not reasonably possible to obtain immediately. The law requires a physician to request prior authorization for specialist consultations, surgical procedures, physiotherapeutic procedures, X-rays or special diagnostic laboratory tests costing more than $500 until July 10, 2007. As of July 11, 2007, the special services must cost more than $1,000 before authorization must be requested. However, as of March 13, 2007, insurance carriers are authorized to require claimants to obtain X-rays, CT Scans, MRIs and other diagnostic tests from a provider or facility within the network it has contracted with for such tests. If the insurance carrier has notified the claimant of this requirement, then the claimant must obtain diagnostic tests from a network facility or provider unless it is an emergency or there is no location within a reasonable distance from the claimant. Yes. If medical care is necessary, it will be provided even though there has been no lost time from work (or less than eight days lost time) and no cash benefits paid. If you are not happy with the outcome, you can have the judges decision reviewed by filing a written application with the New York Workers’ Compensation Board. The application must be filed within 30 days of the filing of the notice of the judge’s decision. And, you must clearly state why you disagree with the ruling. NO! These people are not your friends. They are paid by the insurance company to reduce your benefits. In our experience, speaking and giving information to these people will come back to haunt you. They will pay until they hire an “independent” medical examiner who determines after a two-minute exam you no longer need the treatment. Contact your attorney for a free consultation before talking to them. They are paid by the insurance company to reduce your benefits. Speaking and giving information to these people may come back to haunt you. Contact an attorney for a free consultation about your workers’ compensation claim before having any conversations with these individuals. Only if you let them! You are entitled to your medical privacy with your own doctor. We don’t suggest nurse case managers come to the doctor’s office, much less invade the examination room. They should not be allowed to call your doctor directly or fax him/her forms as they might end up hurting your case. YOUR CHECK WAS REDUCED BECAUSE THAT’S HOW THE INSURANCE COMPANY SAVES MONEY EVEN IF YOU ARE STILL DISABLED. Often times it is clear that you are disabled because of a job accident. However, just because you have a legitimate injury and disability does not mean that the insurance company or the workers’ compensation board will allow payments to you! The insurance company had you examined by one of their paid consultants (the alleged “independent medical examiner”) who believes you are not as disabled as you believe! Remember: It makes sense that you should receive a benefit if you are disabled, unfortunately, the workers’ compensation law is a vast administrative/bureaucratic system that turns on the smallest facts and often does not consider the needs of the actual injured worker! If you have to pay out of pocket to travel to and from a doctor due to a work related injury, you can receive a reimbursement (whether you travel in your car, you pay a friend, you take a taxi or travel on the train or bus!). Each year the New York State Workers’ Compensation Board adjusts the amount of reimbursement per mile based on the State standard for government workers. Did the specific injury or illness arise out of and in the course of employment. That is, did your broken arm, lung disease or herniated lumbar disc happen during work and due to work. In the fifteen years, I have practiced, I have seen almost every disease, illness and injury covered as long as we could prove that there was a work-related link to the condition. Whether it is an orthopedic injury, a neurological injury, a contracted disease, a developed condition, a repetitive injury or an occupational disease, it can be covered. YES – when the insurance company wants to have you examined, you must see their paid defense consultant. However, you have many rights to protect you. Remember – these exams are paid consultations by alleged experts hired by the insurance company to attempt to stop your treatment and benefits. These doctors are NOT your friends, not matter how nice they sound. In fact, you will likely wait far longer for the exam then how long the exam takes. You will then be surprised that this alleged expert filed a six-page typed report but barely spent six minutes with you. If something unusual or just not right occurs during the exam, report it immediately to the New York State Workers Compensation Board, the Insurance Carrier and your attorney! WORKERS COMPENSATION IS ABSOLUTELY NOT A LAWSUIT AGAINST YOUR EMPLOYER! In fact, it is only a claim against an insurance policy that every employer (with some exceptions) in New York must purchase. This is a mandatory policy, like having automobile insurance. Ninety years ago, when Workers Compensation first came into existence an injured worker could only sue for damages against his or her employer, often losing, and even when winning, not winning a lot since it took years to resolve cases! YES. If you settle your lawsuit it will affect your workers compensation case in many ways. When you have a work related accident or injury, and another party/person was partially or wholly responsible for your injury, then you can possibly bring a lawsuit against that third-party (a third party claim). In essence, you will have two claims from one injury, a workers compensation case and a lawsuit against someone other than your employer or co-worker (you can’t sue either in New York except under very limited circumstances, it is your exclusive remedy). New York Workers Compensation Law recognizes that if you do have both claims, then the insurance company should be entitled to recover (recoup a lien) some of the money it has paid out to you. By paying back some money, and getting the permission of the insurance company to settle the third-party claim (consent) you will be entitled to continue to receive benefits under certain circumstances. If you FAIL to get consent – permission – then you will forfeit your right to continue getting medical care and weekly benefits. However, it is the responsibility of your third-party attorney to obtain the consent of the workers compensation case. DO NOT BE FOOLED. Many third-party attorneys do what is right, but others ignore this requirement because it’s easier and quicker to settle the case and get you your money. However, if they do that it is also legal malpractice. DO NOT BE FOOLED – it is the third-party attorneys responsibility. Not yours, not your workers’ compensation attorney and not anyone elses. Yes. Under current case law and New York State Workers’ Compensation Board even if you are disabled, you may be required to look for work within your restrictions. In fact, if you fail to look for work the workers’ compensation board can suspend your weekly indemnity benefits, but you will still receive medical benefits. Generally, we like to avoid having you speak to the case manager – you may say or do something that will cause the insurance company to do something that could be negative on your case. However, if you have a decent relationship following up would be okay, but not suggested. The weekly cash benefit for temporary total disability is computed by taking two-thirds of the workers’ average weekly wage for one year immediately preceding the accident. It may not, however, exceed the legal maximum in effect on the date of the injury. Information is everything in today’s world. Below are some very useful websites when looking for information about work-related injuries. Or, call Markhoff & Mittman toll-free at 855-614-4351 for a FREE consultation. The insurance company is responsible for all reasonable and necessary medical charges connected with your work injury. This includes hospitals, physicians, ambulance charges, x-rays, crutches, physical therapy and prescription charges. There are no deductibles or co-pays, and you do not pay any of the medical costs. All of your medical expenses are paid if the care is reasonable, necessary and associated with your injury. In addition, you are entitled to reimbursement for mileage expenses associated with your medical care. No medical provider can request direct payment, or that you use your regular medical insurance, once you tell them the injury is work related. If your local pharmacy will not bill the insurance company directly for any needed prescriptions, you may wish to contact the Injured Workers’ Pharmacy at 1-888-321-7945. They will bill the insurance company directly so that you have no out-of-pocket expenses. New York Workers Compensation Law requires an injured worker to see a doctor at least once every 45 days if that injured worker is claiming on going lost time from work. If you have already returned to work then you do not have to go to the doctor (only if you want to or need to at the end of your case). No matter how serious your injury, no matter what your attorney says or what the Law Judge sees, everything is based on medical evidence. Without medical evidence we can do nothing for you. SEE YOUR DOCTOR REGULARLY while you are out of work. Yes. We are pleased from a “tactical” perspective to get payments started. We will certainly keep in mind all periods of time claimed for lost time etc. Yes. According to New York Workers Compensation law, you are able to videotape your IME. In fact, we recommend that you do. Record the time that the exam began, the entire exam, and note the time that it ended. Frequently an exam of only a few minutes will somehow translate to a very large written report. Unfortunately, your doctor is not the only party who is allowed to have a say when it comes to your medical care under workers’ compensation. It the medical treatment recommended is not part of the New York State Workers’ Compensation medical guidelines, they need to file a form called an MG2. To learn more about the MG2, contact us today. The medical treatment guidelines are guidelines created by the Workers’ Compensation Board on how an injured person should be treated for their injury under workers’ compensation law. There are guidelines for every part of the body. If I Am Diagnosed With A Permanent Partial Disability Can I Get Lifetime Benefits? Unfortunately, lifetime benefits are no longer available to workers who have a permanent partial disability. This is when an injured worker reaches a state where their medical condition can no longer be improved. In order to obtain wage replacement benefits, yes, you need to miss work. However, there are times when you may get additional money at the end of a case depending on the type of injury and the severity. This typically occurs when permanent damage has resulted in the use of a part of your body and it is called a schedule loss of use. A WISC is a walk-in stipulation calendar. This basically means that the insurance company has agreed to resolve your case by a written stipulation. This written stipulation does need to be approved by a judge. Yes. However, it may be difficult to prove how much you were earning or if you were actually working at the time of the accident. If you were injured will working off the books you should contact an attorney immediately. If I Didn’t Follow The Safety Rules Can I Still Collect Workers’ Compensation? Yes. However, if you are injured, Workers’ Compensation is a no-fault benefit and you will still get lost wages and medical care. There are certain times when violating a work rule can bar you from getting benefits but that is rare.